At Vincent Enterprise we specialize in steel roofing for both new construction and re-roofing applications. 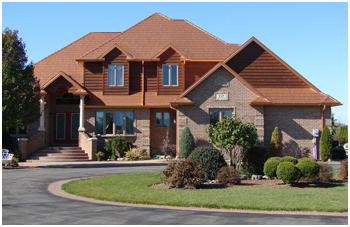 We have one of the largest selections of roofing products and options in Ontario. We also manufacture our own steel roofing panel for custom applications. We only use synthetic underlay materials - not only for their durability but also for added protection and energy efficiency. Steel roofing is the smart choice for both new construction or renovation projects since it reduces energy costs – your home stays cooler in summer and warmer in winter. *Appraisers and Real Estate Agents see increased value in a properties which feature steel roofing products. Our manufacturer’s products are backed by some of the best warranties in the industry. Steel roofing comes in many colour choices, patterns and profiles to match your specific requirements. Roofing products also have various thicknesses available – from 22 gauge to 30 gauge – depending on the type of roofing product. Custom or blended colours are available to suit your preferences. For commercial use custom panels can be ordered for specific roof structures such as Barrel Dormers and Turret. In areas such like Muskoka that experience large snowfalls, the residential homeowners can opt for SnowLok products which break up the snow load into smaller, less dangerous pieces. For commercial applications we offer Snowbars - a similar product but more suited to commercial installations. Contact Vincent Enterprise to request a complimentary estimate on your new housing start or roofing renovation/repair project. Use the Vincent Colour Tool to choose the colours for your Roofing, Soffit and Fascia. We're making it even easier for you! All contents copyright © Vincent Enterprize Ltd.